Superman Unchained is the number one blockbuster mega-series by writer Scott Snyder and artist Jim Lee. Only in its 3rd issue, it's become clear Snyder and Lee are currently crafting what has to go down as the one of the finest Superman tales in recent years and most certainly of the two year old rebooted DC Comics New 52 era. Depicting the current interpretation of Superman, younger, raw, impulsive, only five years into his career as the World's Greatest Superhero and not yet fully comfortable or, to be honest, completely deserving of that title, Unchained sees the Man of Steel encounter a circumstance he's entirely unprepared for: his role in the world as a hero questioned outright. For There Is Another in the world with powers beyond those of mortal men who has been serving the betterment of the world for decades in ways Superman never imagined. While the primary focus of Snyder's story is assessing Superman's greater responsibility to the world as a hero (Lane accuses him of being "a coward" and "the greatest mass murderer in human history" - quite a bit out there - for Superman's "need" for applause and wasting his powers "saving kittens from trees"), Snyder has struck a goldmine of story here, perhaps without fully realizing it. One of the most intriguing but underappreciated aspects of Watchmen, and a major contributing factor to why it holds the lofty and unchallenged title of Greatest Comic Series Ever, is that Alan Moore addressed how a superhuman being like Dr. Manhattan would actually change the world. Not just by saving it from alien invaders, super villains, or natural disasters - the more comic booky threats to humanity. Dr. Manhattan's presence in the world altered technology, culture, elections, and America's standing as a global superpower. Snyder is lobbing the same compelling ideas about Wraith. Wraith landed on Earth in 1938 (the same year Superman's first appearance in Action Comics #1 was published) and served the United States government covertly since that time. Snyder overtly states Wraith has directly participated in every major conflict of the 20th century, sliding the scales and balancing the peace on the side of the United States of America. 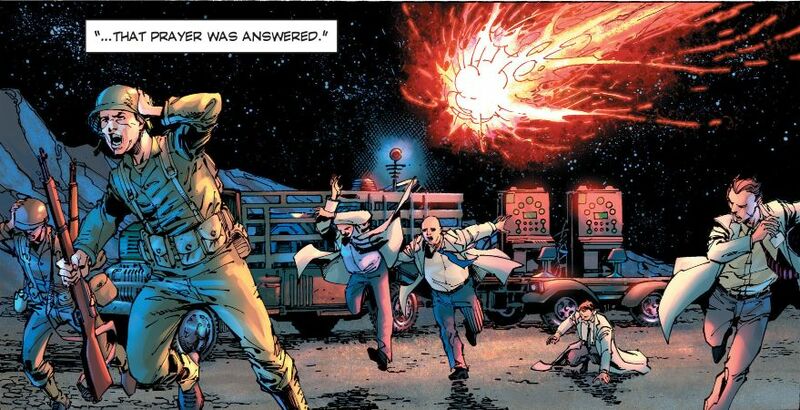 The very first pages of the first issue of Superman Unchained reveal Wraith himself was "the bomb" that was dropped on Nagasaki, which finally ended World War II. Akin to Oliver Stone's recent documentary series Untold History of the United States (which any fan of 20th century history really should watch whether or not Stone's point of view suits yours), Snyder has found the promised land of story potential. The New 52 version of the DC Universe is a clean slate, with superheroes like Superman and the Justice League only emerging 5-6 years ago, and very little is known about what the New 52's history was like before then. By rebooting the universe, The New 52 wiped clean the previous "history" of DC Comics where superheroes have existed since the 1930s and 1940s. 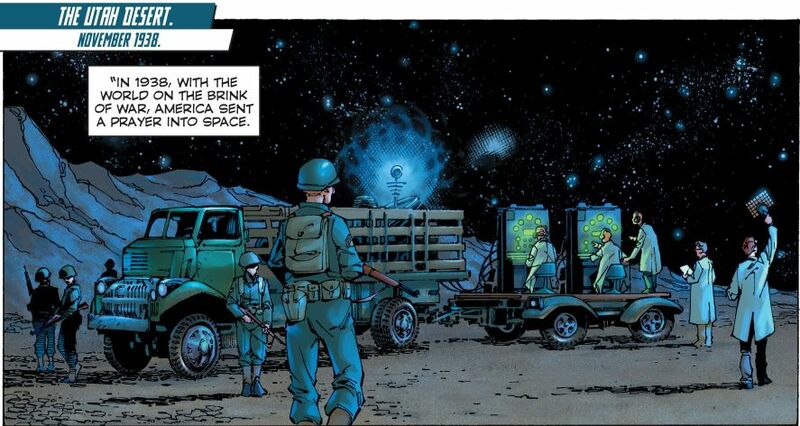 Snyder has now blown the doors open, establishing the first glimpse of the history of the last century in The New 52. Snyder is telling us that everything we assume happened in history, which is a reflection of our own history, was affected and even molded by the actions of Wraith and The Machine. World War II, Korea, Vietnam, the fall of Communism, etc. all presumably happened and Wraith had a hand in it all. Did 9/11 happen? Or maybe it didn't; did Wraith stop it? Or if it did, why didn't Wraith prevent it? There is story here! There's a golden opportunity for DC Comics to pounce on to one day tell the Untold History of The New 52 and reveal to us just how and in what ways Wraith altered the course of human events. It could be an amazing funhouse mirror of our own real-world history. For Snyder, this could be a chance to deliver something akin to his own Watchmen; to be the architect of the New 52's Untold History. Snyder, a disciplined storyteller who does his research, has ample skill dabbling in historical settings in his marvelous creator-owned series American Vampire and Severed. 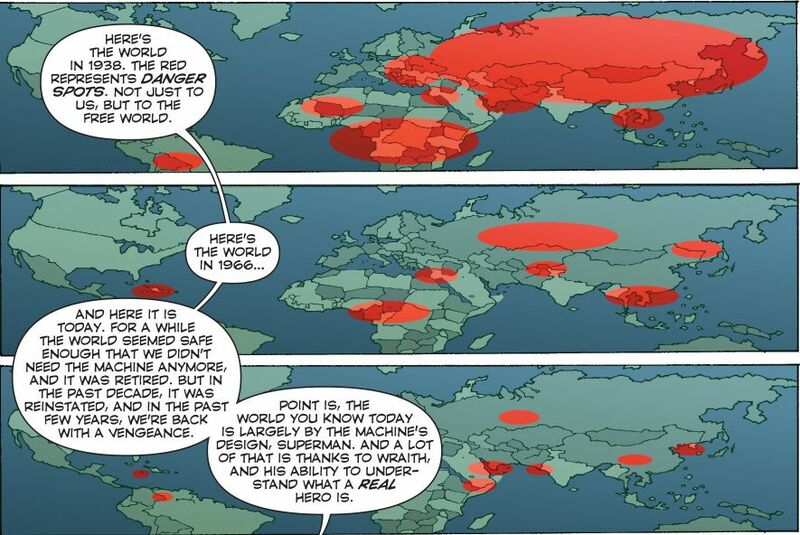 I sincerely hope one day Snyder and DC Comics do finally tell the Untold History of the New 52. It's a history worth revealing. Although, "Wraith", it turns out, is a pretty silly acronym.